Like Melbourne, Perth frequently ranks as one of the world's most liveable cities, and despite its sprouting skyscrapers, fueled by a mining boom, the city exudes a refreshingly relaxed vibe. But you'll still find plenty of big-city tourist attractions and activities. You can dine at fine restaurants, shop at stylish boutiques, browse art galleries and museums, or see some of the country's top talent at its lively entertainment venues. Not far from the city, idyllic Rottnest Island is a popular day trip destination, as is Fremantle, at the mouth of the Swan River. This historic port is the namesake of the famous Fremantle Doctor, a cool sea breeze that blasts the summertime heat from this effervescent, affluent, and gregarious city. With beautiful views of the Swan River and Darling Range, Kings Park and Botanic Garden is an oasis of peace near the heart of the city and one of the largest inner-city parks in the world. Almost two-thirds of this 1,000-acre park is natural bush, with a diversity of native plants and birds. Dedicated to conservation, the botanic garden spotlights plants from Western Australia and other Mediterranean climates such as South Africa and California. Highlights include an acacia garden, the peaceful Place of Reflection, and a water garden that recreates a Darling Range creek. Atop Mount Eliza, with stunning views over the city, the Kings Park War Memorial is a poignant tribute to servicemen from Western Australia. Walking trails weave through the park, and you can even wander through the treetops at the Lotterywest Federation Walkway, suspended in a canopy of eucalyptus trees. Other park features include ponds, play areas, and panoramic viewpoints. After a stroll through the park, pop into Aspect of Kings Park, a retail precinct of gift shops and galleries highlighting local artists. Fraser Avenue Lookout dishes up delicious views of the city, and, at night, the park is the perfect spot for a romantic stroll with twinkling views of the city lights. Local Aboriginals believe the rainbow serpent, "Waugal," created this winding river. To Perth locals and tourists alike, it's the perfect setting for outdoor fun. You can picnic in the riverside parks, bike or hike along the many trails, cast a fishing line, sail, swim, or kayak. To see some of the posh houses of the riverfront suburbs, hop aboard a relaxing river cruise between Perth and the historic port of Fremantle. Another popular day trip is a cruise upriver to the fertile shores of the Swan Valley, Western Australia's oldest grape-growing region. Here, foodies can sample fresh local produce and scrumptious artisan foods at the highly acclaimed restaurants. Most ferries and river cruises depart from Barrack Square Jetty. Sun lovers can choose from a bevy of beautiful beaches in and around Perth. Less than a 15-minute drive from the city center, pine-fringed Cottesloe is one of Perth's most popular beaches, with its clear waters and thriving café culture. Port Beach is also a favorite, and City Beach has a children's playground and plenty of picnic nooks. For families, the sheltered inlets on the snaking Swan River, such as Como, Crawley, and Point Walter are top choices, as well as Rockingham Beach and the sheltered shore at Hillarys Boat Harbour. Trigg Point has one of Perth's best and most reliable surf breaks, and Scarborough is another top spot to ride the waves. Farther afield, the shores of Rottnest Island and Penguin Island offer excellent snorkeling and are great for fun family day trips. Popular with adults and children, the Perth Mint offers a fascinating glimpse into the history of gold in Western Australia. The Gold Exhibition displays the world's largest coin, weighing a whopping one-tonne, as well as gold nuggets and bullion. In the 1899 melting house, you can watch pure gold being poured to form a solid bar, and you can also ogle the largest collection of gold nuggets in the Southern Hemisphere. Hourly guided talks provide fascinating insight into the discovery of gold in the state and the history of the Perth mint, and the tours include a short film. You can even find out your weight's worth in gold. After your visit, stop by the gift shop for unusual souvenirs or enjoy a Devonshire Tea at the cafe. About three kilometers from the city center, Perth Zoo has been delighting animal lovers since 1898. International visitors can experience some of the country's unique wildlife in the Australian Bushwalk and Wetlands exhibits. All the favorites are here: kangaroos, koalas, wallabies, wombats, and Tasmanian devils. Other exhibits take you around the world to different ecosystems - feed giraffes at the African Savannah, ogle orangutans in the Asian Rainforest, enjoy an elephant show, or peer at a pygmy marmoset in the South American primate exhibit. The zoo is easily accessible by bus, car, train, and bike, and you can also hop aboard a ferry from Barrack Street jetty. About 20 kilometers northwest of central Perth, Hillarys Boat Harbour is an expansive marina with restaurants, shops, and family-friendly attractions. The Aquarium of Western Australia is a top tourist draw here. You can stroll through a glass underwater tunnel and observe more than 200 species of marine animals, including stingrays, manta rays, dolphins, and sharks. Bike paths, walkways, parks, and sheltered beaches make this a favorite spot for a fun family day out. Ferries to Rottnest Island also depart from here. In the Perth Cultural Centre, a one-minute-walk from the nearest train station, the Art Gallery of Western Australia houses a collection of both international and Australian art from 1829 to the present day. Special emphasis lies on works from Australia and the Indian Ocean Rim. As well as an extensive collection of traditional and contemporary indigenous art, the gallery displays works by eminent artists such as Hans Heysen and Frederick McCubbin. Looking a little like an alien spaceship or rocket, the Bell Tower in Barrack Square is one of the world's largest musical instruments. Despite it's space-age appearance, housed within are the original 14th-century bells from Saint Martin in the Fields Church, the parish church of London's Buckingham Palace. Entry tickets include an interactive demonstration on the ancient art of bell ringing, as well as interesting exhibits on the history of the bells. While you're here, make sure you take time to enjoy the 360-degree views of the city and Swan River from the open-air observation deck on the 6th floor. For an extra fee, lovestruck couples can purchase a personalized "love lock" to add to a chain-link fence. It's easy to visit the Bell Tower. You can walk here in about five minutes from the CBD. Nearby is Elizabeth Quay, a new riverfront precinct, with restaurants, shops, cafes, and entertainment venues. If you have wiggly kids in tow, Scitech makes a great addition to your sightseeing itinerary. This engaging, family-friendly museum encourages kids to explore science and technology, engineering, and math through imaginative and interactive exhibits. Discoverland is specially designed for three to seven year olds, with displays on air, water, gravity, electricity, and magnets. The construction zone here is great for budding builders, and kids can even dress up as sea creatures and crawl into a tunnel at the small aquarium exhibit or spy on mom and dad through a periscope. Waterlandia explores the water cycle, and older kids will enjoy the planetarium movies and science shows. A puppet theater and special themed exhibitions round out all the fun. Constructed over three centuries, St. Mary's Cathedral is a grand neo-Gothic church consecrated in 1865 and renovated extensively over the years. The site for the cathedral was included in the first plan of Perth in 1838. Evocatively lit at night, the cathedral is a soothing spot to escape the hustle and bustle of the city. Interested tourists can join a tour of the building every Tuesday at 10:30am. Tickets are available at the Church Office across the road. Even if you're not interested in aircraft, you might be surprised by the fascinating displays at the Aviation Heritage Museum, about 15 kilometers south of Perth. Exhibits of more than 30 aircraft and thousands of artifacts cover civilian and military aviation and trace the evolution of aircraft from two-winged WWI planes to present-day passenger jets. For an extra fee, you can also book a personal tour of a Lancaster bomber or a Dakota C-47 and Spitfire Mark XXII. Luxury Hotels: In a lovingly restored mid-19th-century state building, steps away from fabulous shopping and St. Mary's Cathedral, COMO The Treasury blends contemporary styling in its oversized rooms with ornate architectural features. Its modern amenities include an indoor pool, gym, library, and holistic spa. Another heritage building with contemporary touches is the BEST WESTERN PREMIER, Terrace Hotel, within walking distance of the main shopping streets, the waterfront, and Kings Park. Pan Pacific Perth is a larger property in the city center that sits steps away from the Perth Mint and an easy stroll to the shops and restaurants of Elizabeth Quay and the city center. Mid-Range Hotels: Guests love the buffet breakfasts and quaint European charm of Miss Maud Swedish Hotel, a short hop from shops, restaurants, and St. Mary's Cathedral. A great option for longer stays is All Suites Perth, an easy stroll the Swan River, Murray Street Mall, and city buses. Its spacious rooms come with kitchenettes and laundry facilities. Known for its friendly service, the Novotel Perth Langley is another popular mid-range option, less than 10 minutes' walk from St. Mary's Cathedral and only two blocks from the riverfront. Budget Hotels: Offering excellent value for money, the Comfort Hotel Perth City offers large, clean rooms within walking distance to the city center, the waterfront, and the free CAT bus. Other budget options in the CBD, near restaurants and shopping, are City Waters, two blocks from the river, and the family-owned and run Comfort Inn Wentworth Plaza, less than ten minutes' walk from the Perth Convention and Exhibition Center. See the City Sights: For maximum flexibility with your sightseeing plans, purchase a ticket for the Perth Hop-On Hop-Off Bus Tour. With an informative commentary, this double-decker bus takes you to all the city's top tourist attractions, including the Swan River waterfront, Kings Park, and the Art Gallery of Western Australia. You can choose between a 24- or 48-hour pass and hop on and off the bus at any one of the 11 stops. Upgrades include extras like a round-trip river cruise to Fremantle and a tram tour. Escape to Rottnest Island: On the Rottnest Island Tour from Perth or Fremantle including Wildlife Cruise, you can explore one of Perth's most popular weekend getaways from both the water and land. Travel by high-speed ferry to the island and board a 90-minute wildlife cruise to spot fur seals, birds, and dolphins, then enjoy free time to explore the island by bike or on foot. 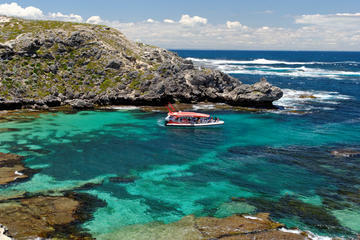 This full-day tour includes a professional guide; the Rottnest Island Authority Fee; and lunch, if you select this option. Explore the Desert: If you're seeking a rugged wildlife adventure, the Pinnacles Desert, Koalas and Sandboarding 4WD Day Tour from Perth is an excellent option. This full-day excursion takes you to Caversham Wildlife Park to see koalas, kangaroos, and other native animals, then to the seaside town of Cervantes. Bump along the dunes in the 4WD vehicle or sandboard down the grainy slopes at Pinnacles Desert in Nambung National Park and enjoy a guided tour of its lunar-like landscapes. The tour includes snacks, a picnic lunch, entrance fees, and pickup and drop-off from your hotel. Learn about Aboriginal Culture: Impressive rock formations, sacred aboriginal sites, and quaint country towns are the highlights of the Wave Rock, York, Wildflowers, and Aboriginal Cultural Tour from Perth. Learn about aboriginal history and Dreamtime stories at the sacred Gnamma Holes, explore an old pioneer town, and see fascinating geological formations such as 15-meter-high Wave Rock on this action-packed full-day tour. From September through November, you might also see stunning displays of spring wildflowers. Included in the tour are hotel pickup and drop-off, transport via air-conditioned coach with a live commentary, entrance fees, and a hearty country-style lunch. Perth, the capital of Western Australia, is the most isolated city in Australia; it lies more than 2,200 kilometers from the tropical tourist town of Broome, where you'll also find one of Australia's top beaches, and about 720 kilometers from Esperance, the gateway to spectacular Cape Le Grand National Park. But you'll find plenty of appealing day trips on its doorstep - the Cape to Cape track in the Margaret River, about a three-hour drive south of the city, is one of the best hikes in Australia. A short flight from Perth, Exmouth is home to World Heritage-listed Ningaloo Reef, as well as some of Australia's best fishing opportunities, and the Horizontal Falls in the state's Kimberley Region is one of Australia's top outdoor adventures. 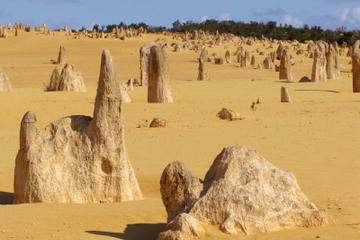 If you need help planning your Aussie travels, see our article on the top itineraries in Australia.